We have just finished the first quarter of the year so it’s time to check in on our 1st Quarter Goals for 2014. Goals are like plants; you need to check on them regularly and they need nurturing. Folks that reach their goals, do regular “goals check-ups”. To do that you need to have an honest conversation with yourself every month. Have you forgotten where the track even is? You did actually write down your goals for this year didn’t you? I hope you took some time at the first of the year to get your 3 to 5 big goals down on paper, but if you didn’t it’s not too late. You know what they say; better late than never. I’ve been talking to a whole lot of folks lately that either never got around to writing them down, or have already fallen off the wagon. If that’s the case, it’s time to get back on track. Statistics say that almost all successful people have written goals. But goal setting is about more than just writing them down. Creating a plan for achieving your goals is the important part. This is where people with even the best intentions often have a problem. If you need a little refresher course on goal setting, here is one of the most important things to remember; you need to determine what your “why” is. “What will make you hang in there when the going gets tough”? Here’s the secret; you don’t need a fancy program. All you need is a great big wall calendar. Now you might be asking, “Why not just use something like Google calendar”? Here is the reason; because it’s not right in your face where you have to look at it each and every day. Your calendar becomes your accountability partner. Some folks might be successful with their goals buried in a folder on a computer, but that is just not the case for most people. Once you have decided on your 3 to 5 big goals, it’s time to take a look at them. Ask yourself this; have you built in some fun and some personal or spiritual goals? Or, when you look at your goals are they all about work?I talk a lot about building a lifestyle business and how you have the ability to do that with real estate investing. This business allows you to have the freedom to create a life and a business that you love. However I have to admit that I struggle with balance. I am determined that this will be the year I finally change that. In order for me to actually make that a reality, I have to put those fun things on the calendar. Plan a day off during the work week to “play hooky”. Or plan a no work weekend and just do something fun you have been putting off. Don’t get me wrong; it’s not only good but also necessary to stay focused when you are building a business. There will be many times you have to work long hours and on weekends. That is the life of an entrepreneur. But there will come a time when you will be completely burned out if you haven’t found a way to balance your work life and your personal life. So be sure to “schedule some fun” every week. Before you start to fill in your big wall calendar, you will want to list each goal on a sheet of paper. Then start the process of breaking those big goals down into bite sized pieces or steps. Once you have your steps, you can begin to schedule those on your calendar so that you can implement your plan. Your calendar becomes your road map to success. If I will be doing my mailings, decide on a database to use for storing my contacts. I will use this for printing my direct mail pieces too. If your goal is to create real estate investing products or build a website then you would follow the exact same procedure. The point of this exercise is to take any goal no matter how big it is, break it down into bite sized pieces and put them on a calendar. Make an appointment with yourself to get it done. If you feel like you have gotten off to a bad start this year, quit feeling bad about it and just begin again. “Get back on the horse” as the saying goes. Get busy creating the business and the lifestyle that you want. 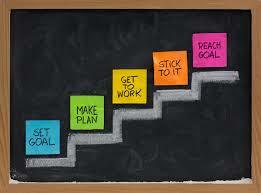 How are you doing on the goals you set for 2014? Have your goals for this year changed in some way? What do you need to do or stop doing to get back on track? Take another look at those goals you set at the beginning of the year. Make any changes or course corrections you need for this second quarter and keep moving forward. I will be checking back at the end of the second quarter to see how you are coming. If you don’t have your big wall calendar, it’s time to get that before this month is over. Thank you for reading Hannah.